Resin sand casting is to evenly mix the sand and resin, curing agent in the sandbox and mold. By heating or catalyst method makes its shape. Casting after closed box. Resin sand casting is a general designation. Precoated sand is one of them. 1. Because eliminate deformation factors in the process of resin sand molding. High dimension accuracy of castings. Surface of casting smooth-faced and clearcutness. 2. Because good resin sand flow, easy to tight, thus save workload, which simplify the modeling operation. High production efficiency and shorten the production cycle. We produce several different grades of ductile iron castings at our foundries. Compacted graphite iron has characteristics midway between ductile and gray iron and combines many of the properties of both. 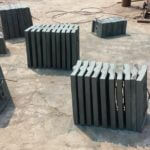 Abrasion Resistant cast irons are widely used in abrasive wear applications involved in the crushing, grinding, milling and handling of abrasive materials such as minerals and ores, both dry and as slurry. Markets served: Agriculture, construction, commercial vehicle ,material handling, hydraulics, power tools, and power transmission, Mining, metallurgy, power plant, cement etc.